Your home is a haven from the elements but improper materials may impact your family’s health. The Smart Living Handbook fills a niche to enable you to make your home functional, energy efficient and supporting of good health. When we talk about sustainability, we often focus on the performance of our built environments but this is only part of the story. To be truly sustainable, our built environments must also be havens that protect us from the elements and, through proper materials specification, are healthy places to live. 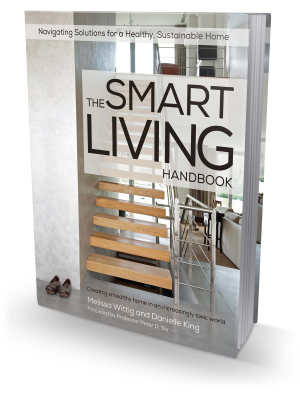 The Smart Living Handbook fills this niche by providing a wealth of information to enable you to make your home functional, energy efficient and supporting of good health. Containing over 300 pages of very useful hints and tips to help you navigate solutions for your home.